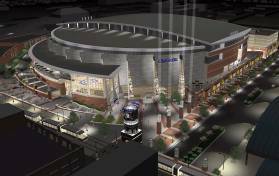 GBB assisted the Charlotte Bobcats with evaluating whether to pursue district energy or self-heating and cooling for the new sports and entertainment arena. In this role, GBB evaluated the district energy proposals received by the Bobcats, estimated the financial savings (if any) from utilizing district energy, and advised the Bobcats on the risks and advantages of using the traditional form of providing heating and cooling versus the two district energy proposals. Based on GBB’s work, the Bobcats are self-heating and cooling the arena.